According to Northwestern Memorial Hospital, a low-residue diet limits the amount of fiber and other materials that need to pass through your colon after digestion. Used after abdominal surgery or in patients with bowel conditions such as diverticulitis, Crohn’s disease and ulcerative colitis, a low-residue diet helps prevent digestive problems by slowing the speed and decreasing the size of your bowel movements. People following a low-residue diet need to eat less than 10 to 15 grams of fiber per day and follow a few additional restrictions. Since whole grains are high in fiber, a low-residue diet allows only refined grain products, such as white bread, white pasta, white rice and refined cereals. You should easily be able to find refined grain versions of most of your favorite grain products. According to MedlinePlus, grain foods should preferably contain no more than one-half gram of fiber per serving. Do not eat anything containing whole grains, including popcorn. According to the Connecticut Surgical Group, you may eat tender, ground or well-cooked meats and fish. Stay away from tough meats, gristle and deli meats. Up to two servings of fluid dairy products such as milk and yogurt are allowed each day; you may also substitute 1½ ounces of cheese for each cup of dairy. Eggs are also allowed. Avoid all legumes as well as all nuts, seeds and coconut. Most tender, well-cooked vegetables without seeds are acceptable, such as carrots, beets, green beans and spinach. MedlinePlus says you may eat lettuce, cucumbers, onions and zucchini raw. You may eat most canned or cooked fruits, with the exception of figs, prunes and berries. According to Northwestern Memorial Hospital, you can eat a few ripe, raw fruits, including banana, melons, peaches, nectarines, plums and apricots. You may drink strained fruit or vegetable juice, but should avoid all dried fruits. Remove the skin and seeds from fruits before eating. According to MedlinePlus, you should avoid all beverages containing caffeine. Chocolate is also prohibited. Ask your doctor whether you are allowed to drink alcohol. You should also avoid spicy foods and any spicy or chunky condiments, such as pickles, sauerkraut, horseradish or spicy mustard. It’s not difficult to devise breakfast meal plans that fulfill low-residue restrictions. Choose low-fiber cereals and refined breads, bagels, or other grain products. 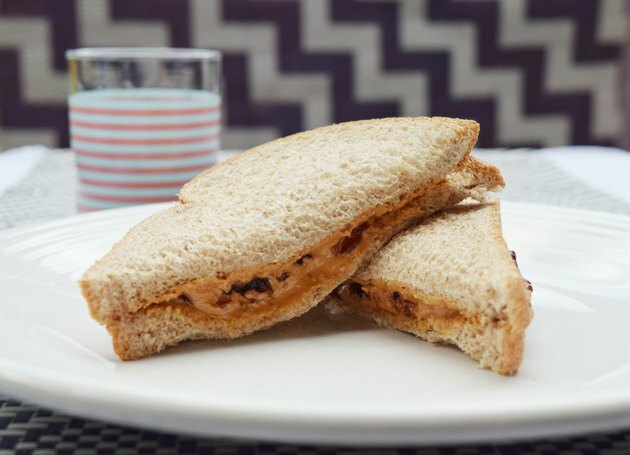 Pair bread with spreads such as jam or honey or top with fried or scrambled eggs. Enjoy milk, yogurt or a bit of cheese. Bacon or breakfast sausage can be added for additional protein. You may have a glass of fruit juice or some banana, applesauce or other allowed fruits. Low-residue restrictions still leave you with plenty of lunch and dinner choices. Pair some meat, fish or eggs with a refined grain, some vegetables or fruit, and perhaps some dairy for added appeal. This scenario can produce a wide variety of meal choices. Entrees might include roast chicken, pasta with meat sauce, grilled fish, pot roast, quiche or chicken soup. Sides can be refined grain product such as rolls or rice, and cooked veggies including carrots, potatoes, zucchini or beets. Enjoy along with a cup of fruit or vegetable juice.